It had become a rare and unusual sight - the sun was shining! In fact, the day ahead was forecast to be the best of the year so far. We had deposited the children with the Grandparents. Things were looking good. We put our glad rags on and made our way to London Victoria, following signs to the ‘Venice Simplon Orient Express’. Checking in was a very civilised affair, with fresh coffee and tea served as we waited for the train to arrive. I am by no means a train spotter, but I do have an appreciation for old trains- especially ones of the steam variety that hail from a more romantic era. The sight of The British Pullman gliding majestically into the platform made me tingle with excitement. It really is an impressive train, albeit without the steam, with it’s distinctive cream and brown exterior, and beautifully detailed embellishments. We found our assigned carriage “Cygnus”, posed for a photo to capture the moment, and boarded the train. 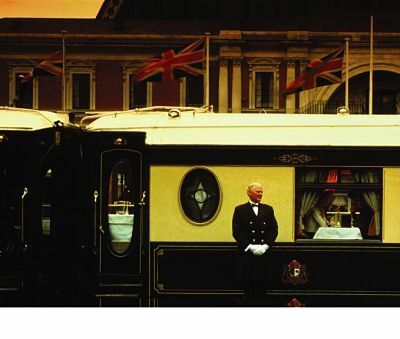 The train is made up of eleven British Pullman carriages; each one with its own name, unique personality and décor. Having been designed and built in the 1920s and 30s each carriage also has its own fascinating stories to tell. From being caught in a bombing raid in the blitz, to being part of Winston Churchill’s funeral train in 1965, to carrying presidents, royalty and heads of state including The Queen Mother, Prince Charles, the Russian leader Khrushchev and General De Gaulle; to name a few. Taking your own tour of the train is an absolute must, so you can appreciate the rich variety and splendour of each of these carriages. The quality of the craftsmanship is evident in every corner; the marquetry wall scenes, mosaic floor designs, custom-loomed fabrics and sold brass work have all been meticulously restored, and have earned these carriages the well deserved description ‘Palaces on Wheels’. There are a variety of ‘Best of British’ day trips available, including a journey to Sandringham House; the Queen’s country retreat in Norfolk, a trip to Cambridge and Ely, taking in the magnificent cathedral or the sights of Historic Salisbury including, of course, the ancient monument Stonehenge. Our destination for the day was the seaside town of Folkestone, a journey that would take us out through London and along the scenic Kent coast. There are, of course, other journeys available from London to other European destinations, including a classic trip to Venice which maybe we should cover in a future review! From the moment we took our seats we were made to feel like guests of honour. The train edged out of the station amid a buzz of excitement and guests toasted the beginning of a special day with a delicious glass of Bellini (sparkling wine and peach juice). Fresh Fruit salad, served with yoghurt provided a refreshing first course. The dish to follow comprised Scrambled Eggs and Smoked Salmon served on a warm crumpet with pan-fried mushrooms, all beautifully presented and served from silver platters. Leisurely pauses between courses allowed us to take in the scenery and attempt to identify some of the stations we were rushing through. Brunch was concluded with a wedge of warm Banana and Walnut cake with whipped cream, and coffee. The last leg of the journey provides some beautiful scenery as the train passes along the coastline. Our arrival at Folkestone West brought a wonderful surprise; a Jazz band playing lively British classics from the platform. Again the air buzzed, as guests in high spirits, made their way to the next stage of their journey. We were taken by coach to the Leas, an Edwardian-era clifftop promenade, and left to enjoy the surroundings in whatever way we chose until it was time to return to the station. This really is a beautiful seaside setting, and one that we had never discovered before. We took some steep steps down to the beaches below and found a peaceful spot to take in some rays. Others chose a more cultural way to spend their time, following the Folkestone Art trail, that includes work by eminent British Artist Tracey Emin. A walk up the zig-zag path took us through landscaped gardens back up to the cliff top and we made our return to the station, where the Jazz band played to herald the start of our return journey. No trip on The British Pullman would be complete, it seems, without partaking in that quintessentially British pastime: Afternoon Tea. We enjoyed a selection of traditional finger sandwiches including my personal favourite; Ham and English mustard, along with freshly baked scones with jam and cream. This was accompanied by a glass of Balfour Rose; described on the menu as “England’s most exclusive pink fizz” from the nearby Hush Heath estate in Kent. An impressive selection of cakes followed that threatened to strain our waistbands to breaking point! I would defy anyone to finish every morsel, but it would be criminal not to at least sample each of the dainty creations. A cup of classic tea is the only thing to conclude such a feast, but if this is not to your taste there is a wide selection of other brews to choose from. Finally we arrived back at our initial starting point, Victoria Station. It had certainly been a day to remember, and one that I could not recommend highly enough if you are looking to celebrate a special occasion, give someone a well deserved treat, or simply want to sample the ‘Best of British’. The arrival of The Book of Mormon in the West End has been hotly anticipated after winning nine Tony awards for the Broadway production. Written by the creators of South Park, Matt Stone and Trey Parker, and one of the creators of Avenue Q, Robert Lopez, it does not disappoint. The Book of Mormon is intelligent, witty, extremely funny, offensive and an excellent musical. I was not quite sure what to expect as I am only familiar with South Park through my daughters who are fans. Whenever they describe a South Park episode to me it always sounds a bit shocking but with an underlying message about American society. 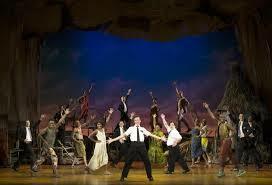 The Book of Mormon is the same but with better songs and a lot of dancing. Elder Price and Elder Cunningham are two nineteen year old Mormons being sent from the safe world of Salt Lake City, Utah, the centre of The Church of Jesus Christ of Latter Day Saints, on a mission to convert the people of the world. While their fellow Mormons are sent to nice places like France, Japan and Norway, our heroes are assigned to Uganda, a country of which they have never heard. They hope it will be something like ‘The Lion King’. Elder Price, who looks and acts like a teen idol, is not thrilled with his new companion, the short, fat, bespectacled Arnold Cunningham, who adores him and declares him his best friend: “This is so awesome because all my friends end up leaving me but you can’t!”. The ambitious Price is convinced this is an opportunity to make a difference in the world as he sings “You and Me (But Mostly Me)”. After witnessing a cold blooded murder by the warlord, Elder Price decides to ask for a transfer to Orlando, Florida, the place of his dreams, despite breaking the rules on leaving his partner. Nabulungi, the beautiful daughter of Mafala, convinces Elder Cunningham to baptise her and convert the other villagers; she thinks that by becoming a Mormon she will get to move to Salt Lake City (“Sal Tlay Ka Siti”) and get away from the terrible living conditions of Uganda. Summoning all his courage, with the song “Man Up”, Cunningham, who never actually read 'The Book of Mormon', decides to educate the locals in his own way, retelling the stories with the help of Star Wars. In his concern for their health and unsavoury practices, like female mutilation, he creates tales which will change the way they live for the better. Meanwhile, after a “Spooky Mormon Hell Dream” involving giant cups of coffee as a temptation, Elder Price reconsiders and decides to go and convert the General himself, bringing him 'the Book of Mormon'. The result isn’t pretty. Elder Cunningham ends up converting the entire village and becoming a hero amongst the white, blonde Mormons boys who sing a hilarious song “I am Africa” all dressed in white. This musical is bound to offend some people if taken on face value. Some British critics have dubbed it racist, but I feel that is missing the point that the play is purposely cartoon like and tongue in cheek, much like South Park apparently. The problems that it depicts, extreme poverty, illness etc., in Africa, are very real and sometimes the only way to get people to pay attention is to make them laugh. For me, The Book of Mormon is really about the innocence of Americans, especially those who are brought up in a cosy, protected world of faith. Mormonism is an American religion, founded in Rochester, New York, as the flamboyant musical tableaus depict. The musical could have been written about any religion but basically seems to be saying Mormons are a nice bunch of people, who believe they can convert anyone to their religion and a better way of life, a mission which carries with it a certain amount of arrogance along with good will. This is perhaps controversial, but I think the writers are trying to bring across a real message with terrific humour. The performers are uniformly excellent, very talented at both singing and dancing, and also extremely funny. American imports Gavin Creel, as the Donny Osmond like Elder Price and Jared Gertner as nerdy Elder Cunningham shine in their roles. Alexia Khadime is also exceptional as the lovely Nabulungi, whose name the smitten Cunningham can never get right, calling her Neutrogena or Nutella. The rest of the cast support them well, especially Giles Terera as Mafala and Stephen Ashfield as the repressed Elder McKinley, amongst other roles. The Book of Mormon is above all a first- rate musical with brilliant choreography and hilarious songs that leave you wanting more. 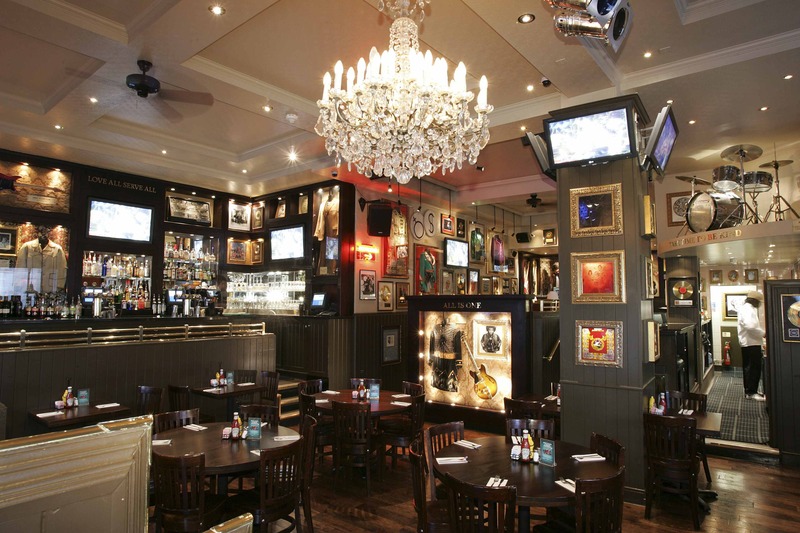 Every time we have visited the Hard Rock Cafe in London we have always had a great time as the atmosphere is lively and the food is good. It is always busy, and the night we visited was no exception. Our kids were very excited to join us, and enjoyed the party vibe as we entered the restaurant. There were a number of other families around us also enjoying an evening out. As some readers may already know, it all started with an Eric Clapton guitar. Back in the seventies, Clapton liked to eat at this quirky American diner in London called the Hard Rock Cafe. The place was this funky old building that used to be a Rolls Royce dealership, and it was run by a couple of young, enterprising and music-loving Americans – Isaac Togrett and Peter Morton. Clapton became friends with the proprietors and asked them to save him a regular table, put up a brass plaque or something – and one of the proprietors said "Why don't we put up your guitar?" They all had a chuckle, and he handed over the guitar, and they mounted it on the wall. No one thought much more about it until a week later, when another guitar arrived (a Gibson Les Paul, by the way). With it was a note from Pete Townshend of The Who which read: "Mine's as good as his. Love, Pete." The young proprietors put it on the wall. After that, the guitars never stopped coming. Today there are more than 70,000 guitars, drums, pianos, harmonicas, microphones, shirts, pants, scarves, shoes, handwritten lyrics, cars, bikes, a bus and assorted rock memorabilia - by far, the largest, most valuable such collection in the world - on the walls of over 163 Hard Rock Cafes, Hotels and Casinos in 52 countries around the world. With this history in mind, you would hope that the quality of the food matches the reputation of the venue, and luckily it does! We started our evening with a drink at the bar, after help from the waiter to select a cocktail from an enticing list. I had the Hurricane – which is one of their signature cocktails (£7.95 - or there is an extra charge for a souvenir glass to take home). My partner enjoyed the Pickled Tink (£6.95) - a thick, delicious frozen milkshake style cocktail. The menu is extensive, with a wide range of choices, but again the friendly waiting staff are on hand to give useful advice. The starters include Nachos, Hickory Smoked Chicken Wings and Potato Skins. We started with the Jumbo Combo (£19.25) – perfect for a family of four, providing a good sample of the other starters on offer. It includes Santa Fe Spring Rolls, Hickory-Smoked Chicken Wings, Onion Rings, Potato Skins, and Tupelo ChickenTenders. This large platter was served with four sauces for mixing and matching, offering a perfect accompaniment. There is a mouth-watering selection of Entrees, including Steaks, Fajitas, Grilled Salmon and Beer Battered Fish & Chips – from £12.45. There is also a list of Smoke- house, Salads and Sandwich options. The Legendary Burger menu is excellent for burger lovers (count me in on this one!). The burgers are priced at £14.95 (with a variety of top- pings available at extra cost), and the Veggie Leggie is £13.95. A smaller 6oz burger is also available for those with a smaller appetite for £10.25. I chose the Legendary 10oz Burger (14.95) which was topped with seasoned bacon, Cheddar cheese, a crisp friend onion ring, lettuce, tomato and pickles. The burger was delicious and cooked to order; medium rare – just the way I like it. Options from the Smokehouse menu are all smoked in-house. My partner chose the Hickory-Smoked Bar-B-Q Combo (Duo Combo priced at £16.75), which offered Bar-B-Q Ribs and Smoked Pulled Pork. For someone who usually prefers a vegetarian option, this was a surprising choice, but one which I can confidently say was heartily enjoyed, proven by the empty plate! The Pulled Pork was a real hit due to its succulence and the accompanying sauce. The kids loved the Lil' Rocker Menu which is great value at £7.50 per child, and includes a drink. One of the kids enjoyed the amply sized Cheeseburger, whilst the other tucked into Cheesy Mac – both offered with a variety of sides, but our kids chose Carrot Sticks (we had warned them to eat something healthy if they wanted a dessert!). The wine selection offers plenty of choice, and we enjoyed a bottle of Blackstone Merlot, California (£19.95). The large bar caters for a fantastic range of beverages. I knew we would have to save some room for dessert - we had promised the kids after all! The dessert list offers a fabulous selection, and we sampled the Fresh Apple Cobbler (£6.75) and the Hot Fudge Brownie (£6.75) – which I must say are two of the best desserts I have ever enjoyed. This was comfort food at its best - homemade, sweet and delicious. The kids enjoyed their Chocolate Fudge Sundaes, which were available for an extra £1.95 on the kids menu. As you enjoy your meal there is always some- thing to entertain you from the music videos or dancing waiters, to the memorabilia that surrounds you. The music is loud, and there are many tracks you will find yourself rocking along to. There is an Entertainment In-House DJ, who selects the playlist throughout the evening. We enjoyed a broad range of classic rock hits, including tracks from Bon Jovi, Deep Purple and Queen, just some of the ones I can remember. Radio Ga Ga had the whole restaurant clapping in time with the video. You will find yourself tapping your feet to most of these familiar tracks, and it is impossible not to be distracted by the amazing collection of rock and pop pieces that are displayed all around the restaurant and between the tables. The service throughout was very good, and seems to work as a well-oiled machine. Staff are cheerful, pleasant and helpful with menu choices, and cater very well to the kids. Hard Rock Cafe undoubtedly houses some of the most fascinating and important pieces of rock and pop history. The Vault, in the basement of the Hard Rock Store over the road, is a must see. They seemingly offer tours every 20 minutes or so. It is housed in an old Coutts bank vault (the vault doors and some of the safes are still in place). Whilst the kids hadn't heard of some of the artists whose memorabilia is housed here, they were very interested to learn more. There are some fascinating original lyrics by John Lennon, one of Madonna's bustiers and the kids got to hold guitars played by Slash and Red Hot Chilli Peppers. Take your camera. It is a fun venue, which is more than just a restaurant. If you haven't yet visited, add it to your list - either book before or get there early, as the queues can be long. In my opinion, a meat feast is a great idea on most nights, but especially appealing on a cold, wintry night in November. On a Friday evening in The City, we entered Bodean's Tower Hill restaurant to a buzzing atmosphere. The large bar at the entrance has a sports bar feel and is very welcoming. We were subsequently surprised by the Tardis feel of the place, as we were taken to our table. The downstairs restaurant area is huge! There was a mixture of large parties and intimate diners, all enjoying the lively surroundings. Bodean's was opened in the UK in 2002 by an American, Andre Blais, who had a dream to bring the taste, the style, and the soul of his beloved Kansas City barbecue to London town. Andre is a keen ice hockey/sports follower, and his goal is to ensure guests feel they are getting the real thing, as if they were sitting 3775 miles away in KC, USA. Whilst I have never been to Kansas City, the restaurant certainly feels as if it is achieving its goal. To start I ordered the Crab Cakes and Gamba Shrimp (£8.95). The Crab Cakes were cooked to perfection; flavoursome and crammed full of delicious crab meat. The Shrimps were among the meatiest I have eaten in a long time. My guest enjoyed the substantial Clam Chowder (£4.50). There are a wide range of 'Teasers' on offer including Nachos (and homemade dips), Wings, Chilli Con Carne, BBQ Ribs and Buffalo Chicken Wings. For our main course we chose the Boss Hog Platter for 2. At £34.95 this consisted of all the meat you could dream of - Spare and Baby Back Ribs, a Jacob's Ladder Beef Rib, Burnt Ends, Pulled Pork, Chicken Thighs and 2 smoked Sausages - a huge platter served with Fries and Coleslaw. The varied meats on this platter pro- vided a flavour of the many popular dishes Bodean's BBQ is renowned for. All their meats are slow cooked at low temperatures, which keeps all the natural juices in the meats and enhances the flavour. This process also gives a wonderful smoke flavour and colour to the meat. We found the meats to be both delicious and varied in their flavours and textures. The accompanying sauces complemented the meats well, and added extra dimension of flavour. Needles to say, we couldn't manage the whole platter, and were both provided with doggie bags so we could enjoy the meats the following day! Among the other main course choices are Sandwiches (you can choose between regular and large), Burgers and Hotdogs, Salads, Home Specials, Chargrilled Steaks, Grilled Chicken, Fish and a great range of Bar-B-Q-Ribs, Chicken and Pulled Pork - not to mention the Burnt Ends (which were one my favourite meats in our platter). Many of my favourite side dishes are also available including Macaroni & Cheese, Onion Rings and Sweet Potato Fries. Prices for the main courses range from £6.25 to the reasonable price of £34.95 for our platter for 2. I like to enjoy a red wine with these kinds of meats, so chose the Malbec. The cocktail list is very good and makes a fantastic aperitif - try 'Blush' or 'Stormy Weather' as favourites recommended by our waitress. We could probably have passed on dessert, so large was our main course, but my guest was tempted into ordering the Pecan Pie, which we shared with some ice cream. This was comfort food at its best...homemade, sweet and delicious. The dessert choices included most of the traditional American flavoured options. Instead of my own dessert, I indulged in a Mud Slide cocktail, the perfect alternative to dessert, pro- viding the sweet and creamy flavour that concludes a very enjoyable and filling meal! Bodean's BBQ is a fun, lively restaurant, with a great vibe. For meat lovers, there is undoubtably a fantastic range of meats, and possibly (and surprisingly!) more food than we could manage in one sitting. It is a great place to visit with your family or a group of friends or to catch a 'Game' (they have screens all around the restaurant, screening everything from Premiership football to American football, and be sure to check out the Game Day specials). Do book in advance where possible, as they can be busy. There are also some great take away options and the offer of full catering for parties and events. You can even buy some of their sig- nature sauces to take home with you - perfect for that doggy bag. Arrive hungry!